Step by step the School for Wellbeing Studies and Research is taking shape as an independent think pond/do tank, and as a creative learning platform. In stead of a Summer Course as planned in 2010 ? our ?summer? was too hot with political turmoil resulting in 95 people killed during violent clashes in Bangkok! ? the School team organized individual public lectures and workshops. In the first place with Nic Marks of the New Economics Foundation (nef), U.K., who passionately explained the importance of a shift from GDP-driven growth towards guidance from National Accounts of Wellbeing. His Happy Planet Index remains an awakening innovation in the world of alternative indicators and Nic is spreading his message as a global TED speaker. Vandana Shiva presented her insights on Earth Democracy. Justice, Sustainability and Peace, the title of one of her recent books, translated into Thai by Suan Nguen Mee Ma publishers, in Bangkok within the framework of the SIFA Public Dialogues organized by the School for Wellbeing. SIFA stands for Saranrom Institute of Foreign Affairs, the training and development arm of the Ministry of Foreign Affairs. SIFA Director is a semi-autonomous academic institute established in the Ministry of Foreign Affairs to facilitate an independent exchange of views on foreign policy and international issues. The panel discussion among Thai experts echoed the concerns of Vandana, as well as her strong inspiration to ?re-claim our commons?. Vandana Shiva announced that she has been asked by the Prime Minister of Bhutan to support the country to stay and renew itself as an ?organic country?. Bhutan will be one of the very few countries in the world, if not the only, that can approximate this status. In most countries organic production is not more than 10% or lower of total ?agribusiness?, as is the case in Thailand: >1%. We plan to form associations and join the Organic Asia campaign initiated by organic agriculture activist Ong Kung Wai, Penang, Malaysia. From the perspective of the mindful consumer we hope to represent our intentions to socialize organic agriculture by strengthening domestic markets at the IFOAM conference/assembly in Korea, September 2011. IFOAM is the International Federation of Organic Agriculture Movements which, since the early 1970?s, brings together independent producers, traders and consumer organizations from all over the world. The Green Market Network in Thailand, like the School for Wellbeing managed by Suan Nguen Mee Ma social enterprise, became a member of IFOAM recently. Other initiatives emerging in Bhutan and supported by co-founders of the School the Centre for Bhutan Studies in Thimphu, are the Samdrup Jongkhar Initiative under patronage of Khyentse Norbu Rinpoche, the Founder of Deer Park Institute in India. Ron Colman, GPIAtlantic, Canada, Advisor of the School for Wellbeing and Prashant Varma, pioneer at Deer Park are central in developing this initiative in South East Bhutan. Somboon Chungprampree plans to join the opening ceremony, an opportunity to shape long term cooperation. The other initiative is the Bhutan Centre for Media and Democracy, founded by Siok Sian Pek-Dorji, the first officially recognized NGO in Bhutan. The second highlight of the year in the framework of the SIFA Public Dialogues was the presentation of Helena Norberg Hodge at Thammasat University. Thammasat is the progressive university of Thailand founded in the heart of Bangkok along the Chao Praya River, by statesman Pridi Banomyong. 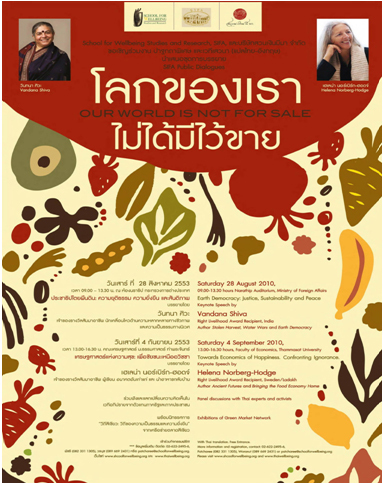 Helena?s message to Bringing the Food Economy Home (one of her books, published in Thai by Suan Nguen Mee Ma) addresses the strong moral and purchasing support needed for the diversity of organic producers and traders trying to strengthen local organic markets in Thailand and throughout Asia. At present most organic products, in particular organic rice, are exported to Europe and USA, while domestic consumption remains weak. Early next year, probably 15 February 2011, Helena?s long awaited film The Economics of Happiness will be screened in Bangkok as part of a global launching campaign. The launching will coincide with the commemoration of the 100st birthday of Dr. Puey Ungpakorn in 2011, the prominent Thai economist and former Governor of the Bank of Thailand, who inspires the search for alternative development pathways until today. The public lectures and dialogues organized by the School for Wellbeing were followed by the launching of its first innovative research project. This meeting took place in the crowded lecture hall at the Faculty of Arts, Chulalongkorn University. This faculty is the home basis of Soraj Hongladarom, professor of philosophy and Director of the Centre for Ethics of Science and Technology, one of the researchers. The project titled the Well-Being Society scenario project was initiated by a presentation of Decharut Sukkumnerd, lecturer at Kasetsart Agriculture University, on Health Impact Assessment (HIA). This evidence-based method of raising awareness, and stimulating dialogue among stakeholders on health risks caused by economic activity, was successfully (until unilateral government intervention) applied to the Map Ta Phut case, a rural area near Rayong, Gulf of Thailand coast, completely overgrown by devastating industrial projects. Eminent importance of ?HIA?, as well as subsequent civil action and environmental rehabilitation movements, was earlier emphasized by Takayoshi Kusago during the panel discussion Are Alternative Indicators Turning the World Upside Down? at the 3rd international conference on Gross National Happiness, Nongkhai and Bangkok, Thailand, 2007. Kusago?s presentation during the GNH panel on the alarming Minamata case in Japan resulted in ongoing exchanges between researchers and civil society representatives from Map Ta Phut and Minamata City. Japanese industrialists have strong stakes in Map Ta Phut as many factories with high negative health impact have been moved from developed countries, under growing pressure, to Thailand and other less regulated countries. It is ironic that recently Thai business conglomerates, supported by the government, and welcomed by the pre-elections Burmese junta, launched the huge heavy industry Dawei project and deep-sea harbour in nearby Burma, including ?infra-structure? linking both industrial estates; more or less at the same moment in history as the belated ?liberation? of Aung San Suu Kyi. The Well-Being Society scenario project intends to develop the HIA method towards a comprehensive approach of comparing three scenarios: the neo-liberal, the communist/socialist and the Well-Being Society scenario. The search for a ?Third Way?, or Middle Way economics have never resulted in a systemic, genuine alternative development path yet. Three aspects of the scenarios will be researched into more depth: property regimes by Surat Horachaikul; the role in development of organic agriculture: Duangjai Rungrojcharoenkit ; and well-being driven social innovations in the world of Information and Communication Technologies (ICT) by Soraj Hongladarom. The last two research topics will be evaluated towards opportunities for social entrepreneurship in the perspective of Bridging the Urban-Rural Divide. While property regimes will be analysed according to their degree of resonance with the three scenarios, taking as the leading question which of the scenarios resonates primarily with private (neo-liberalism? ), public (communism/socialism?) or with new common property regimes: the Well-Being Society scenario. 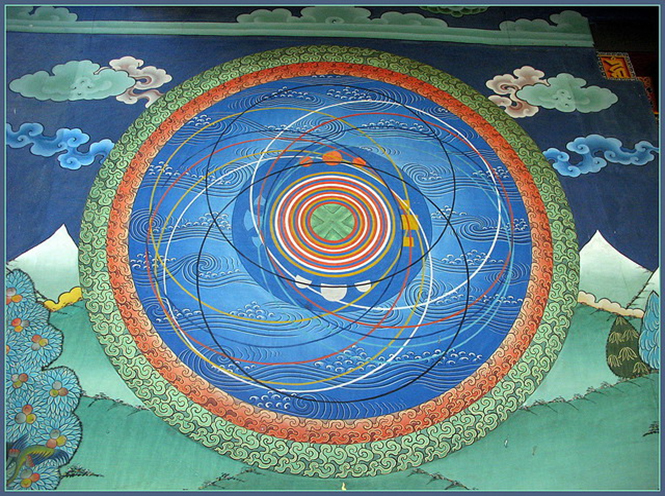 The leading image for our attempt to bring diverse and complex interdisciplinary efforts together in three well accentuated scenarios with clear inner logic, so that they can help making evidence-based policy decisions, was found in a remarkable mural paining in Punakha, Bhutan. A slide of the mural painting was presented for inspiration to the audience by Hans van Willenswaard, Project Director of the 3-years? scenario-project supported by the Thailand Research Fund. Thai Advisors Ven. Dhammananda bhikkhuni and Surichai Wang?aeo closed the meeting with encouragement and critical comments. The School for Wellbeing Studies and Research plans an international exchange on Re-thinking Property and Scenario-building in May 2011. Readers of Seeds of Peace are welcome to share ideas on how to prepare for this creative event. Advice has been asked from Jost Wagner, Director of The Change Initiative and expert in scenario planning, based in Bangkok. Jost worked with Sulak Sivaraksa in the early 1990?s and is now a professional process facilitator. The School proposes to work in close cooperation with the International Network of Engaged Buddhists (INEB) and the Buddhist Economics Research Platform (BERP) on further exploring the concept and practice of Buddhist Economics in diverse contexts. Meetings in Sri Lanka, Europe, and during the bi-annual INEB conference, to be held in November 2011 in Bodhgaya, India, are under consideration.